The knowledge accumulated when developing and using 3M7-40 helped complete a sister machine 4M7-10. This machine cuts materials cleanly by a basket-shape cutting head (which is made by investment casting) and a speedily rotating rotor. Various basket-shape cutting head are available to suit paste products, or flake products of a few centimeter size. Materials are moved against the wall of cutting head by centrifugal force generated by a speedily rotating rotor, where they are cut cleanly. Cutting heads are available in more than 100 types with different openings ranging between 0.25~40 millimeter: they fulfill any needs. peanut butter, vegetable juice, soup, fish meat, meat, vegetable paste, ginger, garlic, mustard, japanese horseradish paste, milky lotion, ointment. Materials are moved against the wall of cutting head by centrifugal force generated by a speedily rotating rotor, where they are cut cleanly. Openings between horizontal cutting edges of cutting heads range from 0.25mm to 40mm, to meet product conditions like paste, flake etc. 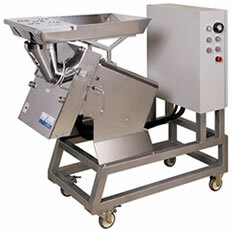 Because of its extremely simple structure, this machine can be disassembled easily, and cleaned completely.